A fun and exciting app to help ESL learners identify and correctlyspell everyday objects. 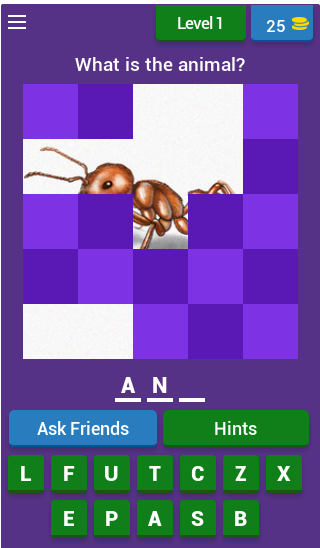 A player needs to click on squares toreveal parts of an image. With the hints they need to guess whatthe object is and choose the correct letters that make up thecorrect spellings. A game to develop students opposite vocabulary. Starting out with350 levels this will challenge even some native speakers. Do youhave what it takes to get to the end? CVC Words to Help Kids Read is an important tool for helping kidslearn how to read. It is appropriate for preschool students,Kindergarten students, grade 1 and 2 students, and even ESL(English as a Second Language) and ELL (English Language Learner)students.The study of CVC Words is an important step in practicingphonics and learning to read. The goal is for these words to bestudied until they can be sounded out by the reader. Studyingsimple CVC words is a powerful and quick way for readers tounderstand that words are composed of multiple letters whichcorrespond to multiple sounds.Over 100 CVC words are included inthis app. They are divided into 5 groups based on the middle vowelin each word. The groups include words with the short a sound,words with the short e sound, words with the short i sound, wordswith the short o sound, and words with the short u sound.This appdoes contain advertisements via Google's AdMob service, but no adswill be displayed from categories that Google labels as sensitive.The study of CVC Words aligns to the following Common Core StateStandards:- CCSS.ELA-LITERACY.RF.K.3 - Know and apply grade-levelphonics and word analysis skills in decoding words. -CCSS.ELA-LITERACY.RF.K.3.B - Associate the long and short soundswith the common spellings (graphemes) for the five major vowels.-CCSS.ELA-LITERACY.RF.K.2.D - Isolate and pronounce the initial,medial vowel, and final sounds (phonemes) in three-phoneme(consonant-vowel-consonant, or CVC) words.1 (This does not includeCVCs ending with /l/, /r/, or /x/. )Note that the process oflearning to read should not be limited to the study of CVC Words.It is also crucial to learn sight words, to practice phonics, andto read with others. Good luck and have fun! It's a free tool for English learners from BBC Learning Englishwith English lessons will help you to improve English skills asEnglish listening, speaking English, English conversation, Englishvocabulary, English grammar, English Dictionary,English Practice,and exercises English. PROGRAMS INCLUDED: The English We Speak,Words in the News, 6 Minute English,Drama,Pronunciation, NewsReport, LingoHack, 6 Minute Vocabulary,6 Minute Grammar LearningEnglish for BBC can help you learn English online daily and canexam preparation the English international certification such asTOEIC, TOEFL, IELTS Currently available for Features English: ★ TheEnglish We Speak. ★ Words in the News. ★ 6 Minute English. ★ 6Minute Vocabulary (Lower-Intermediate) ★ 6 Minute Grammar(Lower-Intermediate) ★ 6 Minute Vocabulary (Intermediate) ★ 6Minute Grammar (Intermediate) ★ LingoHack ★ English at Work ★Express English. ★ Drama. ★ News Report ★ Talking Business ★English At University'. App’s Features: ★ Listen & Read lessonwith Audio & Auto Scroll Transcripts ★ Search lesson. ★ Recentlesson. ★ Bookmark manager. ★ Download audio file. ★ BackgroundAudio Mode. ★ Two listen mode: Online or Offline. ★ Addon EnglishDictionary. ★ Words Bookmark: Learn Vocabulary and New Words. Let'simprove all of your English skills: English Listening, EnglishVocabulary, English Grammar and English Speaking right now. ESL English Podcast Listening with Full Scroll Transcripts andDictionary is a free and a Super tool to help you practice EnglishListening skill daily through many free ESL English Podcast Radiochannel like BBC, VOA, Spotlight English, NPR,... with fulltranscript.Best features:- Listening with full transcript subtitle.The transcript gets highlighted and auto scroll to help you focuson listening.- Listen to multiple free English Podcast Radioschannel: BBC Learning English, VOA Learning English, FreakonomicsRadio, NPR Podcast, Spotlight English Radio Podcast and multiplefree resources: Listening Practice Through Dictation, Stories 4000Essential English Words, Learn English via Listening.- SupportMultiple language dictionaries and Google Translate extension -Translate quickly word or sentence to every language in the world.-Download to offline for listening and learning daily, every timeand every where.- Headset button listening control for moreconvenient listening process- Memo to bookmark and memorizevocabulary.- Adjust the play speeds.- Sleep timer.- Day and nighttheme.- Custom font, size, and color of the article's transcript.-Update latest lessons.List Podcast in this app:BBC Learning EnglishRadio Podcast- 6 Minute English- Drama- English at University-English at Work- Lingo Hack- News Report- The English We Speak-Words in the NewsNPR Radio Podcasts- All Things Considered- Ask MeAnother- Fresh Air- Morning Edition- Planet Money- TED Radio Hour-Wait Wait... Don't Tell Me- Weekend Edition Saturday- WeekendEdition SundayVOA Learning English AudiosVOA Learning EnglishVideos- English @ The Movies- English In A Minute- Everyday GrammarTV- Learning English TV- News WordsSpotlight English RadioPodcastsFreakonomics Radio PodcastListening Practice ThoughDictation4000 Essential English WordsStories from the ListeningPractice Through Dictation and 4000 Essential English Words bookseries which are AVAILABLE for FREE at http://compasspub.com. Thisapplication was created to make learning English easier and WE DONOT OWN ANY DATA. If possible, you should buy Listening PracticeThrough Dictation and 4000 Essential English Words books to learnbetter.Learn English via Listening:This series was old and now youcan get it from the internet. This application was created to makelearning English easier and WE DO NOT OWN ANY DATA.If you arepreparing English examination, such as IELTS, TOEFL, TOEIC, IBTetc, you should try this. It's best to learn English. **NOTICES:-This app created for more convenience and efficiency for thecontents of Radio English Podcast resources.- Radio Podcastproviders have all copyright about these provided contents.You willhave good English listening skills with this app. Thank you! Learn English with free lessons daily. Let Mondly teach you theEnglish language quickly and effectively. In just minutes you’llstart memorizing core English words, form sentences, learn to speakEnglish phrases and take part in conversations. Fun English lessonsimprove your vocabulary, grammar and pronunciation like no otherlanguage learning method. Beginner or advanced learner, traveler orbusiness professional with a tight schedule? The app works greatand dynamically adjusts to your needs. Explore language exercisesfor reading, listening, writing and speaking enhanced with adictionary, verb conjugator and state-of-the-art speech recognitiontechnology - you’ll feel like having your own English languagetutor in your pocket. Download the language learning pill today andenjoy the benefits of learning a new language for life. The secretpath to language learning Remember the English language classes inschool? You started with hundreds of basic words and expressions,continued with tons of English grammar lessons and at the end of afull semester’s language course you could barely translate asentence or say “Hello!” to a foreigner. That’s the traditional wayto learn a language. Mondly has a different approach, that’sopposite to the average language course. This is how the future oflanguage courses looks like The App gets you started with a basicconversation between two people. You quickly start memorizing corewords, use them to build sentences and phrases, and at the end of a45-minutes module you are able to reconstruct that conversationwith your own voice. It’s an effective way to learn Englishphrases. State-of-the-art Natural Speech Recognition and SpacedRepetition Algorithms make the app effective for learninglanguages. Here are the key features that make Mondly a great tutorfor you: Crystal-clear audio and professional voice actors. Learnthe right English pronunciation from conversations between nativespeakers. State-of-the-art Speech Recognition. Mondly knows exactlyhow to listen to your English words and phrases. You will only geta positive feedback if you speak English clearly and correctly.This will improve your pronunciation. Useful phrases for realsituations. Memorizing hundreds of isolated words is not the way togo when it comes to learning English. Mondly teaches you Englishvocabulary by offering you core words and phrases. The app breaksthe learning process down into short lessons and puts them intothemed packs. Learn conversational English. Conversation is themain reason to take this free course. It will help you build a coreEnglish vocabulary with widely-used nouns and verbs, and speakEnglish clearly. Verb conjugations. If you want to learn moreduring this course, just tap the English verbs and get the fullconjugation on the screen, including the translation. It’s fasterand better than a dictionary. Advanced Statistics. The App usesintelligent reporting, so you can always follow your progress.Build your vocabulary step by step and become better daily. TheLeaderboard. See how your friends are doing and compete with peoplefrom all over the world to become the best learner in the Mondlycommunity family. Take the Weekly Quiz to become even better.Adaptive Learning. Learning English is different from person toperson. So we taught the app to learn from your way of learning.After little time spent together, Mondly will understand what suitsyou best and it will become your own guide and customized teacher.Kids will love it as well. Before you know it, at the end of theseEnglish lessons, you will master the most useful 5000 words andphrases and you will be on the fast lane to learning a newlanguage. Learn American English with free lessons daily. Let Mondly teachyou the American English language quickly and effectively. In justminutes you’ll start memorizing core American English words, formsentences, learn to speak American English phrases and take part inconversations. Fun American English lessons improve yourvocabulary, grammar and pronunciation like no other languagelearning method. Beginner or advanced learner, traveler or businessprofessional with a tight schedule? The app works great anddynamically adjusts to your needs. Explore language exercises forreading, listening, writing and speaking enhanced with adictionary, verb conjugator and state-of-the-art speech recognitiontechnology - you’ll feel like having your own American Englishlanguage tutor in your pocket. Download the language learning pilltoday and enjoy the benefits of learning a new language for life.The secret path to language learning Remember the American Englishlanguage classes in school? You started with hundreds of basicwords and expressions, continued with tons of American Englishgrammar lessons and at the end of a full semester’s language courseyou could barely translate a sentence or say “Hello!” to aforeigner. That’s the traditional way to learn a language. Mondlyhas a different approach, that’s opposite to the average languagecourse. This is how the future of language courses looks like TheApp gets you started with a basic conversation between two people.You quickly start memorizing core words, use them to buildsentences and phrases, and at the end of a 45-minutes module youare able to reconstruct that conversation with your own voice. It’san effective way to learn American English phrases.State-of-the-art Natural Speech Recognition and Spaced RepetitionAlgorithms make the app effective for learning languages. Here arethe key features that make Mondly a great tutor for you:Crystal-clear audio and professional voice actors. Learn the rightAmerican English pronunciation from conversations between nativespeakers. State-of-the-art Speech Recognition. Mondly knows exactlyhow to listen to your American English words and phrases. You willonly get a positive feedback if you speak American English clearlyand correctly. This will improve your pronunciation. Useful phrasesfor real situations. Memorizing hundreds of isolated words is notthe way to go when it comes to learning American English. Mondlyteaches you American English vocabulary by offering you core wordsand phrases. The app breaks the learning process down into shortlessons and puts them into themed packs. Learn conversationalAmerican English. Conversation is the main reason to take this freecourse. It will help you build a core American English vocabularywith widely-used nouns and verbs, and speak American Englishclearly. Verb conjugations. If you want to learn more during thiscourse, just tap the American English verbs and get the fullconjugation on the screen, including the translation. It’s fasterand better than a dictionary. Advanced Statistics. The App usesintelligent reporting, so you can always follow your progress.Build your vocabulary step by step and become better daily. TheLeaderboard. See how your friends are doing and compete with peoplefrom all over the world to become the best learner in the Mondlycommunity family. Take the Weekly Quiz to become even better.Adaptive Learning. Learning American English is different fromperson to person. So we taught the app to learn from your way oflearning. After little time spent together, Mondly will understandwhat suits you best and it will become your own guide andcustomized teacher. Kids will love it as well. Before you know it,at the end of these American English lessons, you will master themost useful 5000 words and phrases and you will be on the fast laneto learning a new language. Link sentences, smash words and learn English grammar with ourunique and exciting learning method! Play games with lessons thatexpand your vocabulary and improve your listening and speakingskills. This English grammar trainer and vocabulary buildercontains over 200 simple lessons, grammar exercises and practicegames that are suitable for ESL beginners, basic level students andintermediate level learners (A1, A2 and B1). It also includes asimple color-coded grammar book, listening exercises and challengegames, which will test your English knowledge. Learn and expandyour British or American English vocabulary and improve yourpronunciation. It will teach you the syntax skills you need forconversation, in your ESL classes or for IELTS and TOEIC testpreparation. Use the clear and simplified book for quick tips.Learn by yourself and practice the sentence patterns and vocabularythat you need to get speaking. This learning method is fast, funand effective! Beginner, basic and elementary language level (A1and A2) includes: * Present simple tense - the verb "to be" andother verbs * Past simple tense - regular verbs and irregular verbconjugation * Articles, pronouns and possessives * Singular andplural forms * Positive and negative phrases * Question forms andshort answers * Demonstrative pronouns * Determiners andconjunctions * Present continuous/progressive tense * Basicadjectives and adverbs * Comparatives and superlatives * Future *Imperative * Present perfect tense - regular verbs and irregularverb conjugation * Basic time words and phrases and the use ofdifferent tenses * And more Intermediate language level (B1)includes: * Prepositions * Past continuous tense * Action verbs vsstate verbs * Conditional Tenses * The passive voice * RelativeClauses * Prefixes and suffixes * And much more Other features: *The app includes an irregular verb conjugation trainer. * A wholesection is devoted to suffixes (which is very useful for TOEIC andIELTS test preparation) to train and help you recognise noun, verband adjective forms. * The grammar reference book includes a listof irregular verbs and has very simple color-coded grammarexplanations and real world examples of that grammar in use. * Foreach learning level (A1 & A2 and B1) there are challenge gameswhich test your language skills for the whole level. * Each chapterhas listening practice (also helpful for TOEIC and IELTS testpreparation). * Choose whether you want to learn American orBritish English vocabulary and pronunciation. * Play a variety ofinteractive games which are designed to program your brain quicklyand keep you motivated. * The trainer gives you tips when you makemistakes. the learning method fixes mistakes instantly. * This appis suitable for ESL beginners (A1), basic level students (A2) andintermediate English learners (B1). It is suitable for adults andkids. * Use it in class, school, at home, on "English as a SecondLanguage" (ESL) conversation courses, or as a supplement for TOEICand IELTS preparation courses. * Learn the words and vocabularythat glue sentences together and are essential for speaking andconversation. * Practice with unlimited example questions that showthe use of grammar structures in real world conversations. * Thelessons are split into small bite-sized lessons for quick dailypractice sessions. Keep going if you wish! * The course has beencarefully designed by experienced British English teachers. Improveyour speaking skills! We advise that you listen carefully and speakthe words as you play. It will help you expand and remembervocabulary and improve the skills you need for conversation. Ourmission is to make learning English grammar fun for everyone.Download now and learn fast with the most exciting ESL learningmethod & vocabulary builder ever! Want to learn foreign language, but have no time forself-studies?We believe that regular practice is the key!easy tengives you 10 new words to learn every day. It’s that simple!10 newwords a day is 70 new words a week, 300 new words a month, 3650 newwords a year. While native speaker use only 3000 of them in hiseveryday life.20 minutes a day is all it takes to succeed with easyten.Learn Spanish, Portuguese, Italian, French, German &RussianAny starting level.up to 20 new words a day.Frequencyvocabulary of 10 000 most commonly used words.All words arevoiced.Twitter examples for all words.Smart notifications.Storingyour progress in CalendarTotal personalizationPronunciationtrainingCool testsAchievementsYou’ll love to study with easy ten! Since the 60s organizations used the " Test ofEnglish as a Foreign Language " (TOEFL) test to measure the Englishlanguage ability of non-native speakers wishing to enroll inEnglish-speaking universities. TOEFL Vocabulary Practice is the appthat covers the most important words used for the real TOEFL testexam. The list of words were carefully selected by language expertsand if these are mastered, chances of a successful TOEFL test passare very high.Each of the 650+ TOEFL vocabulary comes with full definition,sample usage, phonetic/sound pronunciation and much more details asincluded in the Oxford dictionary. You can learn these words andtake language tests to see how well you understand them. You'lllearn words faster as this TOEFL practice app uses different typesof quizzes to make learning interactive. It includes TOEFLlistening exercises, helps you with TOEFL reading practice, TOEFLwriting and TOEFL speaking.Main Features:✔TOEFL Vocabulary with 650+ Words. This app has a vocabularywith 650+ words used in the TOEIC test. These are neatly divided in12 different categories that span every important domain (i.e.Psychology, History, Environment, Linguistics, ...). Each categorywill show you how many words it contains and you can tap to see thelist of words & start learning those.✔ Easily Learn the Words. Each word in the TOEFL dictionarycan be easily learned. Tap on each word to listen how it ispronounced and also read a detailed description. Once you're readyto start learning it, you will need to type it 4 times. The first 3times you'll have suggestions (auto-complete), but the last timeyou'll need to type it in correctly to be marked as learned.✔ Test your Vocabulary. For an effective study you will needto test the newly learned words. There are 4 different types oftests you can take: type/choose a word based on the presenteddescription, pick a description that matches a word, use scrambledletters to create a word based on a description and lastly listenand type the word. These tests simulate partially the real TOEFLtest.✔ Word Training. You can also train for a set of words tosee how well you master them. The difference between training andtesting is that during training you won't be "penalized" if you getsome wrong answers. This allows you to practice words for the realTOEFL exam without any pressure.✔ Daily New Words. The only way to truly learn ispersistence! The app helps you learn every day by teaching you somenew words. It will also show a push notification to remind you thatit is time to study. You can change the number of daily new wordsshow in the app settings. For extra help you can enable an onlinespell-checker to verify words as you type them.✔ Random Test. Every now and then (randomly) the app willask some questions to check your vocabulary knowledge. These randomlanguage tests are a great quick study method to remember what youlearned.TOEFL Vocabulary Practice is an essential app for those that wantto pass the TOEFL test. It also allows you to customize thedefinitions for vocabulary words by choosing a main one out of theexisting definitions. This TOEFL practice makes perfection thus adaily intake of vocabulary words will help you learn faster and beprepared for the final exam.With the help of this educational app you can fine-tune your TOEFLlistening and reading skills or advance from starter to Englishlanguage expert. We are committed to help you learn & preparefor a TOEFL exam thus any feedback is appreciated in the commentsbelow!